Radiohead’s show in Toronto on June 16 was cancelled after a crew member died and another was seriously injured during the set-up of the stage. A portion of the stage had collapsed. The show at Downsview Park, a 40,000 sellout, was immediately called off and ticket-holders warned not to set off for the venue. Toronto police spokesman Tony Vella explained what had happened: "They were setting up when the top portion collapsed on top of them. Unfortunately, four people were hurt. The remainder of the people, when they heard the stage coming down, ran from the area." Some fans had already arrived at the arena, hours before the show was scheduled to begin. One eye-witness, Jaime Rivest, told reporters: "It was like a tornado hit the stage and in just moments the stage came down with metal everywhere." She added that security staff quickly evacuated the area. Alexandra Halbert, who was working near the concert site, told the BBC: "I turned around and the whole top part of the stage had collapsed, as well as the scaffolding. It seemed like there were a couple of minutes of hesitation and no one knew quite what to do. It was only afterwards that we all realised how serious it was." 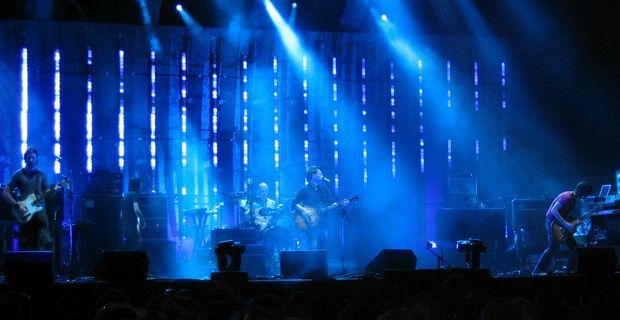 After the accident, Radiohead’s website and Twitter feed urged fans not to go to the site. The summer of 2011 was characterised by several similar incidents on the North American festival circuit and at the Pukkelpop festival in Belgium. The worst incident was at a Sugarland show at the Indiana State Fair, where seven people were killed by a scaffolding collapse in high winds.